There is a wide range of quality museums to choose from in the capital city of the country. 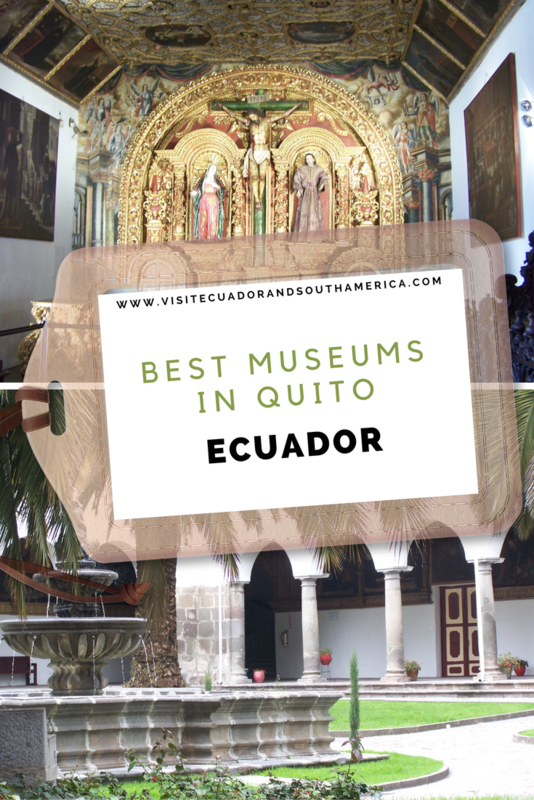 As a matter of fact, you can find some of the best museums in South America in the capital city of Ecuador. I confess, I have yet to visit some of the museums in this article. You can find this museum on the northern part of the Basilica del Voto Nacional. The museum has permanent and also temporary art exibitions. The location of Casa de Alabado museum is just on the South of Plaza San Francisco. This is a small museum that offers a very impressive and also wide collection of pre-colonial art. You get to learn all about the different tribes that inhabited Ecuador before the time of the Inca. The museum is located just east of the Plaza de Santo Domingo. ( Garcia Moreno Street, between Morales and Rocafuerte)The museum is open from Tuesday to Sunday, 09:30 – 17:30. El Museo de la Ciudad is one of the most gorgeous restored historic building. It offers information about the history of the city. Starting with indigenous groups, the arrival of the Inca civilization, to the Spanish colonization, and up to more modern times. Located in Calle Mariano Calvache E18-94 y Lorenzo Chávez, esq. ( Barrio Bellavista). The museum showcases the work of the legendary Ecuadorian Artist Oswaldo Guayasamín. Opening hours are from Tuesdays – Sundays 10:00 – 17:00. (closed on Mondays and holidays). This museum is dedicated to Mariscal Antonio José de Sucre’s life, a hero of Ecuadorian independence. Visit this museum to travel back in time. This museum features the history of Quito and especially the times of the colony and independence. This museum belongs to the Banco Central del Ecuador. The museum is located on Av. Patria between 6 de Diciembre and 12 de Octubre. The museum has a great collection of items, including Indian and Inca artifacts, breathtaking intricate sculptures among others. This museum offers 17 rooms showcasing the 21 different ethnic groups in all the regions of Ecuador. In addition, there is a special room dedicated to the fauna of Ecuador. It is located in the Escuela Politécnica Nacional University. The museum houses the oldest and most important pale-ontological collection of the country. The museum is located in the historic center. Ecuadorians refers to this museum as the water museum and is located on the western part of the city. This is an interactive, hands-on museum that teaches about the importance to fight water pollution. It is a great museum to raise awareness about the environment. Here, you can learn valuable information on how to preserve water. Located just 200m northeast of the Mitad del Mundo Monument. It is a local private attraction, reportedly built to mark the Equatorial line. This museum offers a variety of activities and also knowledge of Ecuadorian culture. Tour guides will demonstrate tricks which are possible only on the Equator. Due to the Coriolis effect water will be flowing both counter-clockwise and clockwise down a drain. In addition there is balancing eggs on the head of a nail, or weakening of muscles due to latitude. In conclusion, as you can see the capital city of Ecuador boasts a wide range of museums for you to choose from. I invite you to discover the wide range of museums throughout Quito. Have you been to any of these museums?